H. H. A. Jossé (his sale, Paris, 28-29 May 1894, no. 42, as attrib. to Slodtz). (Thomas Agnew and Sons, London); The Hon. Irwin Boyle Laughlin, 1916, Washington, D.C.; his wife, Therese Iselin Laughlin, Washington, D.C., 1941; their daughter, Gertrude Laughlin Chanler, New York, 1958; gift to NGA, 2000. Eighteenth Century Drawings from the Collection of Mrs. Gertrude Laughlin Chanler, NGA, Washington, D.C., 1982, no. 22 (as Michel-Ange Slodtz). Renaissance to Revolution: French Drawings from the National Gallery of Art, 1500-1800. National Gallery of Art, Washington, 2009, 218-219, 289, no. 94 (color). Sharp, C.J. and A.P. Oppé. 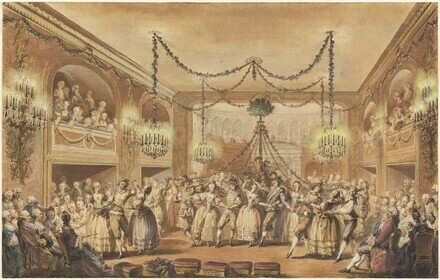 The Dance, An Historical Survey of Dancing in Europe. London, 1924: pl. 52 (as Michel-Ange Slodtz). Souchal, François. Les Slodtz, sculpteurs et décorateurs du roi (1685-1764). Paris, 1967: 463, 699, no. 190 (as Slodtz).